For Pet Supplies Plus stores in Bloomfield Hills and White Lake, Michigan, the hot steamy days of July have been renamed the Cat Days of Summer – for 200 meowing reasons. The stores are ushering in 200 cats that will be available for adoption as part of the Pet Supplies Plus Cat Days of Summer event July 9 - 11. The cats and kittens are being transported from Oakland Pet Adoption Center in Auburn Hills and Elizabeth Lake Animal Rescue in Waterford. They have all been health checked, vaccinated and spayed/neutered and are just looking for good homes. Event hopes to ease overcrowding of homeless pets in Oakland County, Michigan. Customers will be treated to free hotdogs, sales on all pet supplies along with no sales tax, drawings for door prizes including gifts baskets from The Gifted Pet http://www.thegiftedpet.com/ plus all the fun of a summer festival. Those adopting a cat or kitten can have a free photo taken of their newly-adopted pet and also get a free goody bag with items from Pet Supplies Plus and Nooters Club® which promotes pet spay and neuter and responsible pet guardianship. “If you are looking for a new feline companion, this is the place to be,” said Addy Shattuck, owner of Pet Supplies Plus stores in Bloomfield Hills and White Lake. “We will have all different breeds, colors and sizes of cats and kittens. We are hoping that we can find homes for more pets in Oakland County. " Avoid keeping pets in parked vehicles for even a few minutes. Lack of air and rising temperatures can quickly be fatal even on “cool” days! Keep pets inside to avoid heat stroke. If they must stay outside, provide shade and plenty of water. If you travel with your pet, check out area emergency veterinary hospitals before you need them. Watch for antifreeze that can leak from your vehicle if your engine overheats. Antifreeze tastes sweet, is inviting to pets and children and can be fatal even in small amounts. Cat Days of Summer will take place at Pet Supplies Plus stores in Bloomfield Hills at 2057 Telegraph Rd. (North of Square Lake) and in White Lake at 6845 Highland Rd. (M-59) and 8020 Cooley Lake Rd. on Friday, July 9, 4 p.m. - to 9 p.m.; Saturday, July 10, 9 a.m. - 9 p.m.; and on Sunday, July 11, 10 a.m. - 4 p.m. Cat adoptions Sunday only at the Cooley Lake Rd. store. Hope all the kitties find a good home at last!!! Car, the best pic ever, thanks goodness the ladies had the decency to cover up!! -Ms. Z.
Ms.Z thanks!! Can't take credit for it. The marketing firm that sent me the press release sent the photos too. That IS a fabulous photo I love it! Love your comment about it as well! These cats must have enjoyed thier day :) totally awesome photo. 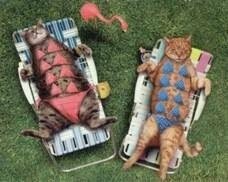 @Christian-Pet Care, yes the bikini kitties are having a good summer I believe!! Cute cats and I wish also that they may find a perfect home before Christmas... I was just wondering if cats and bunnies can be good buddies. I have a cat and my boyfriend is going to give me a bunny in rabbit hutch but of course they need to play out to right? I am so excited about the gift but I am worried how my cats will react. Hi Kylie! actually this post was done in June....about 60 or so cats were adopted that day. There are tons more cats who need to be adopted. I am not sure about cats and bunnies being good buddies, I have seen photos that lead me to think that they can be. When you bring the bunny home put the SAME PERFUME on you, the bunny and your cat (and on your boyfriend too!) that way you will all smell the same and the cat will be more likely to accept the bunny. What a great idea for pet adoption! Glad to hear that a lot of the cats found homes.